I’m always looking for good ways to show the different dental issues that horses can have. This illustration does a pretty good job of that. 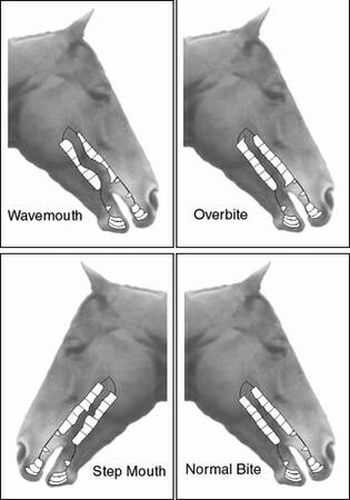 Of special interest is wave mouth because it affects around 70% of all horses I see. The problem with wave mouth is that it gets worse with age – the teeth that are too long continue to get longer and the teeth that are too short continue to get shorter. Eventually the teeth that are too short get weak and fracture. An overbite is a dental conformation abnormality in which the top molars are a little too far forward in relation to the bottom molars. Since they don’t match up correctly, horses tend to develop large hooks on the first upper molar and the last bottom molar. Step mouth is many times due to trauma to a tooth that allows the opposite tooth to overgrow and get too long. Luckily, all of these conditions can be managed and many times corrected if horses start receiving dental care early enough in their life. Copyright © 2019 Texas Equine Dentistry. All rights reserved. Equine Website by Beyond Indigo Equine.